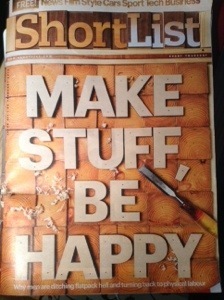 If you’re a regular Shortlist reader, you might have spotted this recent cover feature on “making stuff”. In it, Matt Hussey explores the recent increase in men swapping their desk jobs for manual labour – whether it’s building bikes or making furniture. According to psychologists it can go some way to combatting male depression, an unfortunate side-effect of our country’s service sector love affair. Previous Post Three things I’ve learnt. Totally agree! And it’s not only men! I’m doing mosaics and it’s soo rewarding to be able to create something with my own hands! Love it! Good luck to you!! !